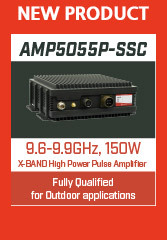 Exodus Advanced Communications is pleased to introduce our compact high power 5.4-5.9GHz 2KW Pulse amplifier. Exodus AMP4039P-2 provides 2000 watts with a minimum power gain of 63dB. The unit has excellent gain flatness, fast Rise/Fall times and excellent pulse characteristics. Included are amplifier monitoring parameters for Forward/Reflected power, as well as voltage, current & temperature sensing for optimum reliability & ruggedness for all applications. Weight is <45lbs, and dimensions of 19”W x 22”L x 5.25”H.